Our friends, the Noltas, made a trip to Liberia this summer. They made a few upgrades and repairs at the orphanage, as well as ordering and purchasing several school desks. We hope you enjoy the pictures of a furniture company delivering the desks. 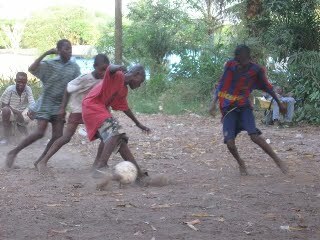 Mitch, founder of Peace Is The Goal, sent soccer balls and other gear with our friend Eric Lewis to Liberia. He just found our website online, and emailed us asking if we'd like some soccer gear. Mitch is a 17 year old young man that plays soccer in Wisconsin. He sent 12 balls, 7 backpacks, 2 gear bags and a ball pump. 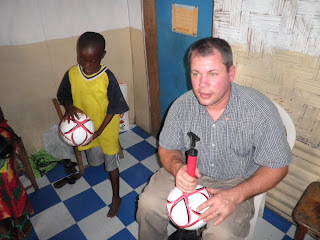 Check out the pictures of Eric and the soccer balls he was able to take to Liberia. 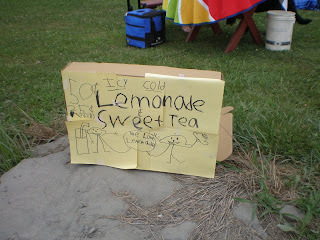 A young lady in Pennsylvania raised money for the orphanage by having a lemonade stand. 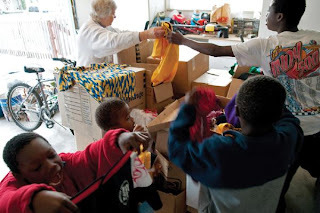 How great is the faith of children trying to help children? 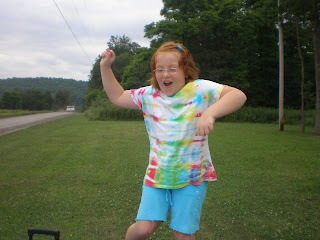 SHe raised $60 in 2 days! 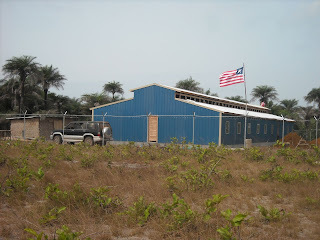 The last week of July 2009 a crew of 9 people went to Liberia and finished the common area and orphanage side of the facility! We were able to move the kids in! YEAH! Here are a few pictures from the newly finished site. A special thanks to Eric, Joel, Joe, Tim, Kipp, Bill, Brant, and Kelly for all their hard work. Here is Eric installing the solar panels. So great that the orphanage has power (current) that is green, sustainable, and free. Here is the wind mill and water storage tank. The wind blew nearly every night recharging the batteries to provide power! The water storage tank provides gravity fed running water to the showers, kitchen, bathrooms, etc. 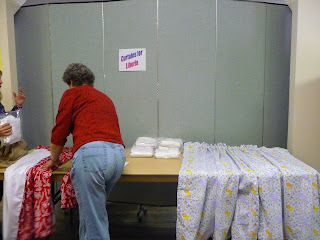 Here are pictures of some of the quilts and curtains made by the women at E-Free Church in Montrose, PA. They sure do brighten the place and make it much more kid-friendly. Here are pictures of the new playground, called Matthew's Play Place. An 11 year old daughter Alex and her 2 friends, Sammy and Savannah wanted to find something to do to help other people less fortunate then themselves. They decided to try to sell friendship bracelets for $1.50 and send any money they raised to causes close to their heart. Half the money they sent to the orphanage project and the other half they sent to fundraiser for one of the girls cousins who is suffering from terminal brain cancer. Alex has 3 siblings that were adopted from Liberia through Addy's Hope and currently is waiting for her newest brother to come home. They sold bracelets to family, neighbors, friends and even got permission to sell them to the teachers at their elementary school. They have worked incredibly hard and were able to raise $175 for the orphanage project! They feel so good about doing it they decided to keep going. They have decided to name their group Friends for Africa." *** Update *** Brant has 752 pairs of undies!!! 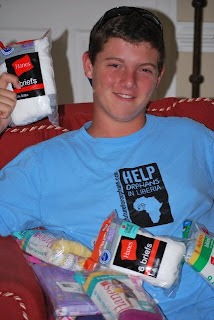 Brant Dixon in Winston-Salem, NC is traveling to Liberia to meet his new brothers at Addy's Hope later this month and he hopes to take hundreds of pairs of underwear with him! On Monday, July 13, Brant sent out an all-points bulletin to family and friends seeking donations of new kids underwear. Challenged by his brother, Jay, who in September, went without his usual birthday presents and instead asked party guests to bring tee-shirts and underwear for the Addy's Hope kids, Brant decided to see what he could do!! Support and encouragement are pouring in to B's email inbox---and so are the undies! He collected 218 pairs on Tuesday alone---and he's just getting started!! 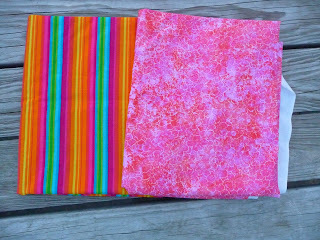 Quilts, curtains, and backpacks....OH MY! 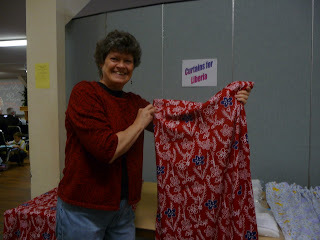 Ladies at the Montrose Evangelical Free Church are making curtains for the new orphanage and school in Liberia. They are picking out bright, cheerful fabric to use for the curtains that will be in the bedrooms and classrooms. There are 18 windows to decorate in the orphanage. 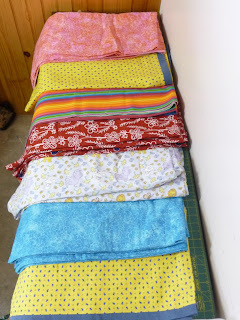 A few women are making quilts for sound absorption and color and there are backpack patterns that you can make for the village children that will be going to school there. 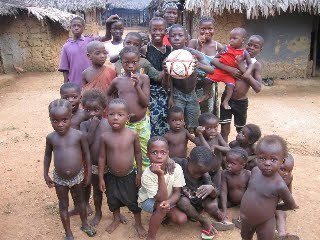 They are very excited that doing such a simple thing is going to make a difference in children's lives in Liberia! An orphan living near Monrovia, Liberia in West Africa decorated this bookmark. 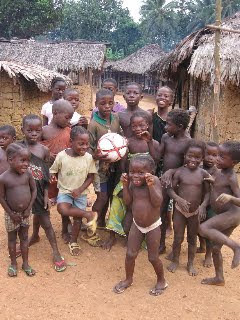 Feel free to put this in your favorite book or give to a friend as a constant reminder of the children of Liberia. 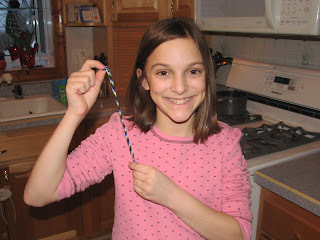 Some kids in Pennsylvania are selling the beautiful Threads of Hope bracelets and necklaces again this year. Threads of Hope (http://www.threadsofhope.com.ph/) is a great organization that let's you donate 40% of the money raised to the cause of your choice and the other 60% goes back to the women in the Philippines who made the bracelets and necklaces. They are donating the 40% to Amazima Ministries (http://www.amazima.org/) and Addy's Hope Orphanage Project (http://www.futurefororphans.com/). The bracelets/anklets are $1.00 and the necklaces are $2.00. They have found that the necklaces work as cute headbands too! If you are interested in buying any of them please email them at hopefulcards@yahoo.com and tell them what color(s) you would like. It will cost $1.00 if you need them mailed. 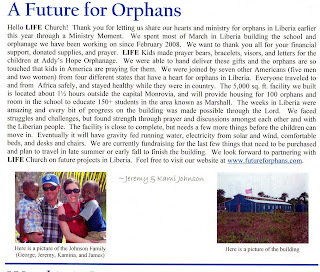 Orphanage Project Liberia was featured in our chuch's newsletter, Lifeline. Thanks Life Church for your support! 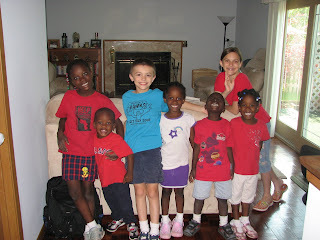 A young lady in Pennsylvania is helping to raise money for Orphanage Project Liberia. If you would like to order some hand made cards that will help orphans in Liberia, please contact her. Here is a message from her. I wanted to continue helping the orphans and people of Liberia so my mom and I brainstormed and came up with the idea of making and selling handmade cards to raise money for Liberia. I asked my sister and my 2 friends and they quickly agreed to help! The money from the sale of the cards is going to Addy's Hope Orphanage and Orphanage Project Liberia! We are selling a pack of 6 assorted cards for $5 and there is a small fee for shipping that depends on how many packs you buy! If you would like to order a pack of cards please email us at hopefulcards@yahoo.com and tell your family and friends about this opportunity to reach the orphans of Liberia! 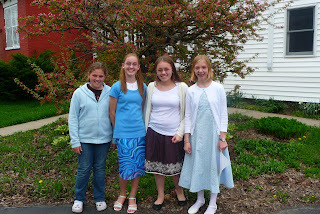 Here is a picture of the lovely young ladies making the cards. Here are some great pictures of these gorgeous cards!!! The kids at LIFE Church in Fort Collins, CO made notes, prayer bears, visors, and bracelets for the children at Addy's Hope Orphanage. The children at the orphanage loved their gifts and were so thankful and happy that children in America were thinking of them. On Monday April 13th our friends Todd and Holly with Africa Bags had a fundraiser for their upcoming trip to Malawi. We also had a Passion Africa meeting (more of a get together) and were invited to give a presentation about our project. 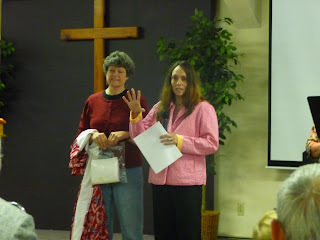 About 50 people attended, including friends and Orphanage Project Liberia supporters. It was truly a great opportunity to show those in Northern Colorado what had happened in Liberia, as well as thank people for their time, prayers, donations, and support. Here is a slideshow of pictures from that night (thanks Todd for taking them!). Kami ran the slideshow while Jeremy spoke. It was a really fun night. Here is a photo of what we were able to get accomplished on this trip. It is not complete, but the amount of work that was done in the 6 days we had to work with is a true miracle. The progress is that the exterior walls, roof, bathrooms (one boys and one girls restrooms with two toilets each and a sink for each), kitchen floor, and well are completed. The fence is mostly done, but we do not have a gate. The other items left to start/complete include electrical, plumbing, install 9 windows, install an exterior door, desks, chairs, book shelves, kitchen roof, kitchen shelves, beds, interior walls for bedrooms, interior walls for class rooms, ceiling. Here is a slideshow of all the construction pictures! Margibi County Senior Senator Clarice Jah came to look at the progress of the project. We were honored to give her a tour of the future facility and explain how the entire surrounding community will benefit in many ways. Here is a picture of the construction crew. Click here for a great newspaper article about the 4 men who were on the team that traveled from Pennsylvania! So the container is set to arrive in Liberia very soon! Kami leaves March 7th and Jeremy leaves March 14th to go and build the school and orphanage. There are currently 7 other people coming with us. 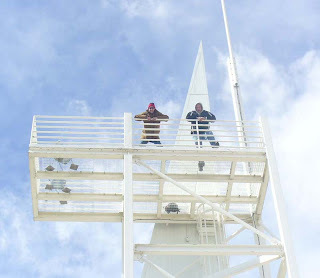 Jeremy and Kami hope to have it mostly completed by the time they leave on April 1st. We will be sending out email updates (see below to sign up) and will try and post pics and updates on this website. 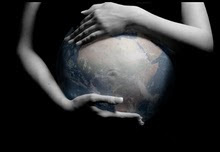 If you would like to receive email updates while they are on their trip send an email to Kami at bluecowgirl@yahoo.com with the word "update" in the subject line. Kami was able to give a presentation at Calvary school to show them the pictures from the well and additional water fixtures their fundraised money purchased in Liberia! 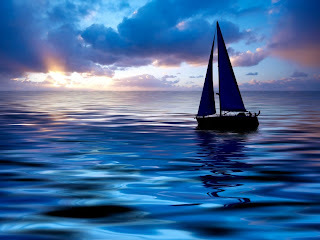 Enjoy the slideshow! God is doing amazing things in Winston-Salem, North Carolina where the Calvary Middle Schoolers ROCKED their well project fundraiser by raising an incredible $3,562.24! This is more than $1000. over goal and will provide for ALL the well materials, drilling, labor costs and now, some terrific upgrades--- including better plumbing and also sink and toilet fixtures for the interior of the new orphanage. Awesome job! Way to go, Cougars!!! THANK YOU to every one who donated!!! WOW! The CBDS Middle School Cougars are on a roll---they've raised over $1000. at the halfway point of the well fundraiser!! *Mrs. Morris's and Mrs. Clark's home bases are nippin' at your heels in 4th and 5th places!!! Keep bringing in CHANGE and any other donations! The Calvary Middle School is off to a SUPER-FAST start collecting over $500 for the well in just the first 3 days of the project!!! Way to go----KEEP IT UP, COUGARS!!! We are pleased to partner with the middle schoolers of Calvary Baptist Day School, in Winston-Salem, North Carolina. This energetic bunch of 6th, 7th, and 8th graders has commited to raising funds for the drilling of the water well at the school and orphanage. Their "CHANGE FOR ORPHANS" project kicks off on Tuesday February 10th with an assembly and runs through the end of February. Students are encouraged to donate the change they would spend on soda, sports drinks, and Starbucks treats to the project. 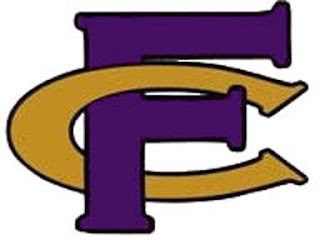 Students could also consider donating a portion of their allowance, doing chores to raise extra money, asking friends and family for donations of spare change --- all in the hopes of raising $2,500. The Calvary home room that donates the most money will earn an extra incentive --- the chance to soak their Principal, Brenda Lidbom, with water balloons at the middle school social on February 27th. Go Cougars! We are starting to collect bottles of chewable children's vitamins and over the counter meds (no liquids please) to take with us in a few weeks when we head to Liberia to build the school/orphanage. Please send Kami an email at bluecowgirl@yahoo.com if you are interested. 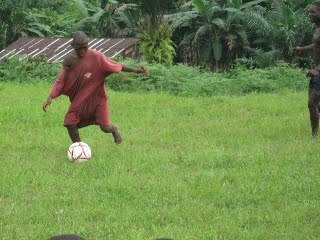 Petra, from Half Moon Bay California, contacted us with an offer of as many soccer uniforms as we could carry to Liberia. She is shipping boxes to gear to our house and we will take it on the place. Greg Thomas with the Half Moon Bay Review interviewed Jeremy, and the article came out today. Click here to read the article. Today the container was loaded onto a truck and is headed to Houston to be put on a ship. Thanks to Joe at Crystal Landscape for bringing their equipment down to help load the container. 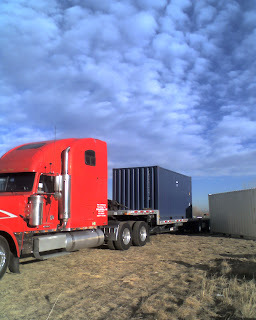 The last items to load in the container have arrived. 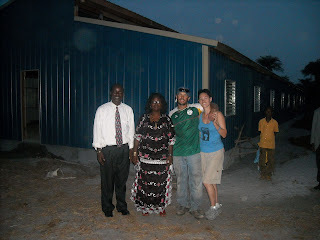 Thanks so much to Mel Wright for designing and building the solar and wind power system for the school/orphanage! Here is a picture of Mel describing the components to Jeremy. Here is a picture of the solar panels. Here is a picture of Jeremy and I in front of the container tonight with the last bits loaded. Tomorrow the conatiner will be fumigated tomorrow, aired out on Tuesday, picked up and put on a truck on Wednesday, arrive in Houston on Friday, and then be on a boat headed for Africa! Thank you to everyone who has helped and/or been supportive of this project. Please pray for the safe travels and arrival of this container full of goods that will help the Liberian people.